There’s no way around it: Color is the most impactful creative element in visual design. From the enchanting scenic backdrops of set design to the intricate compositions of pixel art, a robust understanding of color is the master key to compelling communication. Need proof? When participants in a recent brand-focused study were challenged to draw the logos of 10 iconic corporations, only 16% were able to recall accurate shapes and design features. However, when asked to identify a brand’s color palette, the number of correct replies shot up to 80%. Color also plays an influential role in the world of user interface design. The digital products we interact with on a daily basis rely on the strategic use of color to communicate important information, so it’s critical that UX and UI designers understand how to wield color wisely. 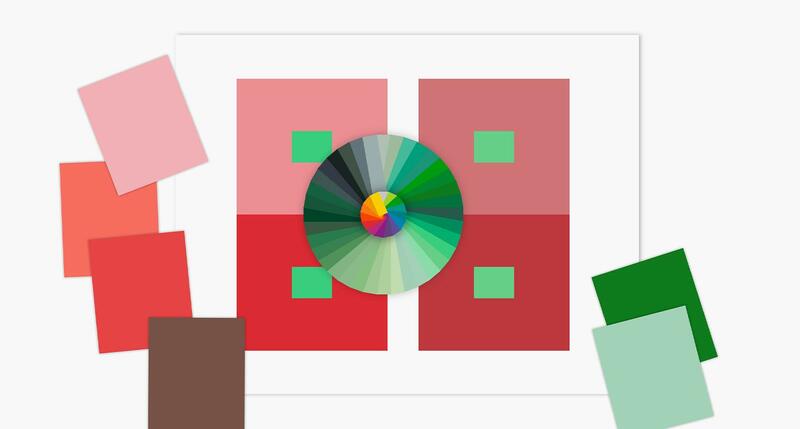 Empower UI designers to create their own remarkable color schemes. The goal of this guide is color competence, followed by color confidence, all for the sake of amazing color execution in the user interfaces we encounter every day. Color theory is an expansive field of study with its own terminology, methodology, and scientific underpinnings. It can be complicated, but that’s not what we want. What we want is an understanding of color that can be applied with lightning-quick precision. We want to use color the way we use shapes—effortlessly, boldly, and effectively. Saturation overload kills color vibrancy. Simultaneous contrast has pros and cons. Basic color schemes are best. Observing shadows and highlights in nature is an easy way to see color relativity at work. A: The brain and eye work together to help us understand that the flower as a whole is actually bright red. 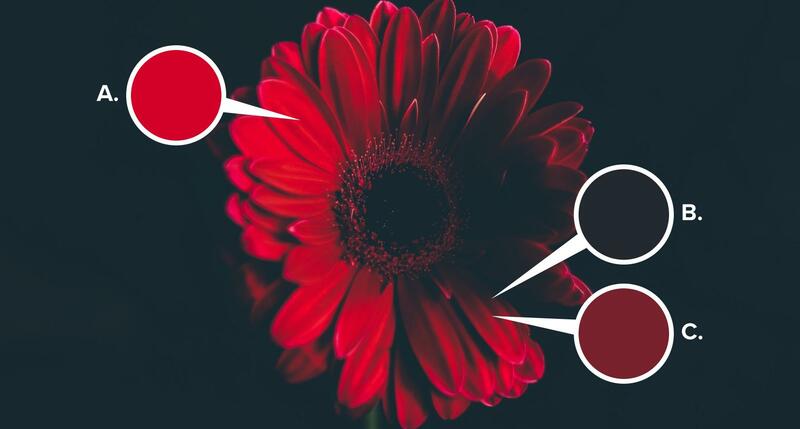 B & C: The dark brown of the flower’s shadow (B) makes the highlight on the petal’s ridge (C) appear much brighter than the dull maroon color it actually is. Essentially, the light shining on the petal’s ridge and the color of the shadow work in tandem to trick the eye and intensify the highlight. 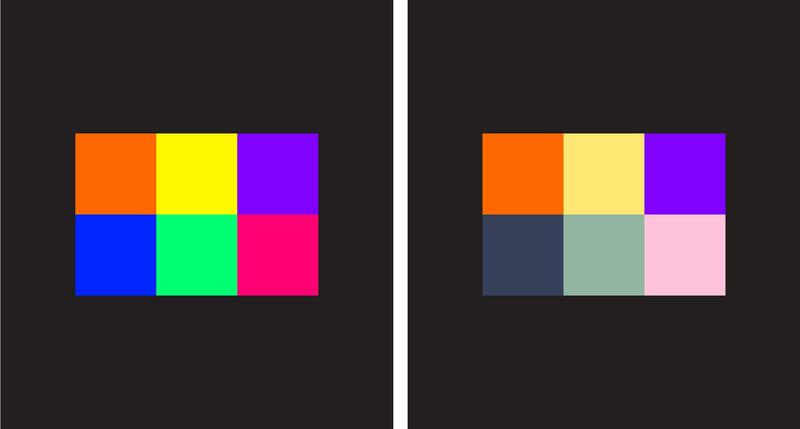 Both of the interior boxes are the same hue, saturation, and brightness. However, the interior box on the left appears to be darker than the one on the right because its surrounding color is lighter. In UI design, color relativity isn’t always as obvious, so colors within a scheme should be tested against each other. Why? Because that beautifully arranged selection of colors in your style guide may turn out to be problematic when applied to an interface. Colors that look great as isolated swatches don’t always work together within a user interface. Testing colors against each other, especially for contrast, is a simple but crucial step in the UI design process. The big takeaway? Don’t coddle your color concepts. If a swatch of accent yellow looks lush when surrounded by whitespace in Sketch but clashes with a UI’s dominant color scheme, find a different solution. 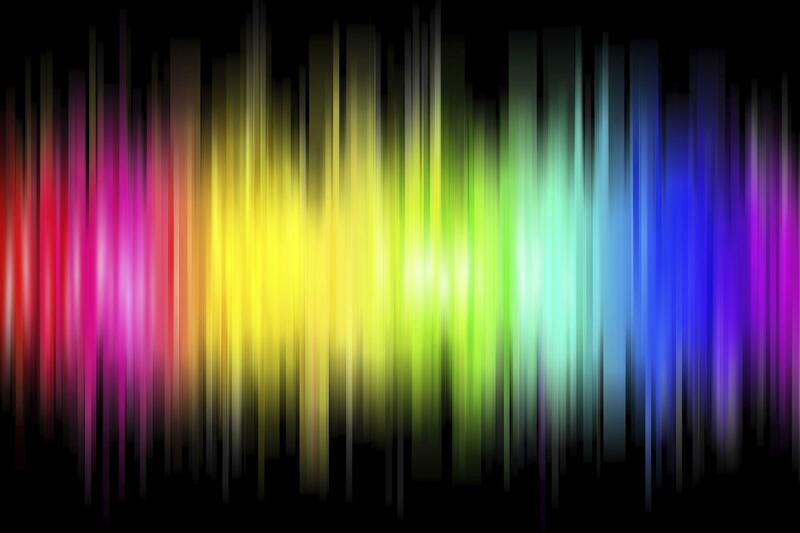 Color saturation is integral to color vibrancy. However, a scheme assembled around nothing but highly saturated colors overwhelms the eye, and vibrancy is diminished. With color, less is more. A highly saturated color becomes vibrant when used in tandem with less saturated colors. Left: The colors in this grouping are at 100% saturation and brightness, but no one color stands out as more vibrant than the rest, and the overall scheme is garish. Right: The top left orange and top right purple haven’t changed, but both appear more vibrant and the scheme is more harmonious because the surrounding colors are less saturated. Simultaneous contrast occurs when color complements of the exact same value are placed adjacent to one another. The effect is so intense that it causes the point where the two colors meet to vibrate or pulse. Notice the visual tension where the blue and orange meet. This is simultaneous contrast, a dynamic color effect that UI designers can use to great advantage. For UI designers, simultaneous contrast can have positive and negative outcomes, so it’s important to understand how to control the potency of this visual phenomenon. 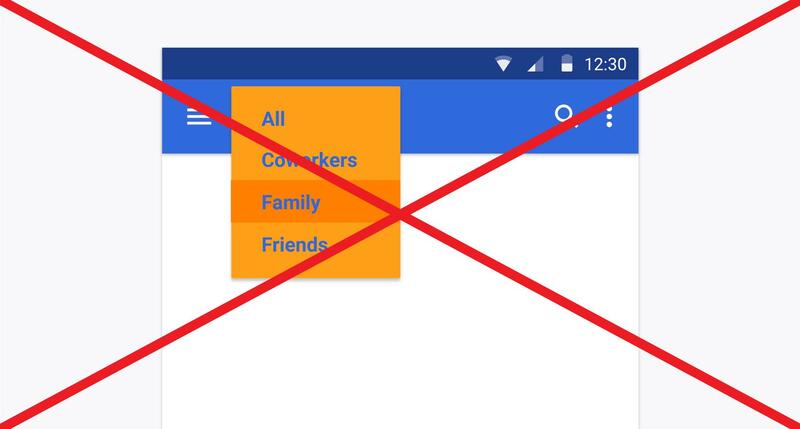 For instance, in an interface designed around a variety of blues, using a complementary orange with the same value as the blue anchor color would be a great way to draw attention to notification icons. However, that same orange and blue combo would be migraine-inducing if used for the text and background of drop-down menus. Simultaneous contrast isn’t appropriate for every UI design decision, especially where text is involved. Rainbows are beautiful—in nature. In UI design, color must be used more selectively or it overwhelms the experience. 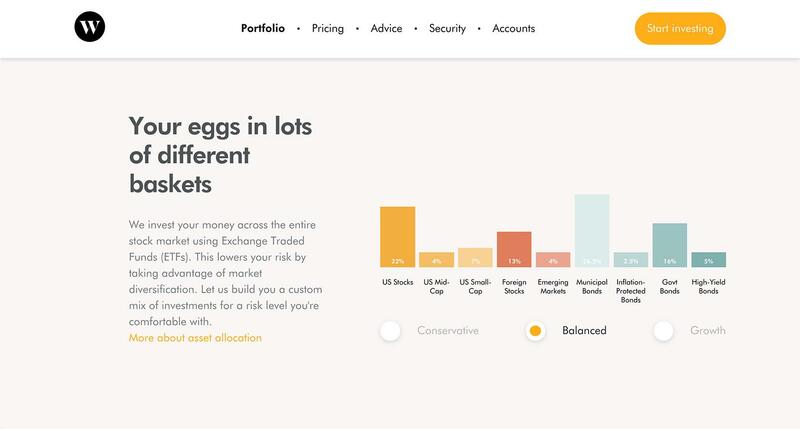 Even when brands have high-impact palettes with a wide array of options, it’s best to show restraint and build user interfaces around simple color schemes. These eye-pleasing schemes consist of colors that are closely grouped on the color wheel. Analogous color schemes are easy to find in photos of natural environments, especially plant life, and they tend to be visually calming. Variety in analogous schemes comes from shifts in saturation and brightness, not major hue changes. When using an analogous scheme, try adding one highly saturated color from directly across the color wheel to create emphasis within an interface. It’s easy to create “visual mood” in analogous schemes by choosing between warm and cool colors and experimenting with saturation. Complementary color schemes are based on the interplay of complementing cool and warm colors that exist across from one another on the color wheel. Color variety is achieved by altering saturation and brightness between the complementing extremes. Using too many bright, highly saturated colors undermines the impact of complementary schemes. Red and green are the complementary colors, and a selection of less saturated variants tie the scheme together. 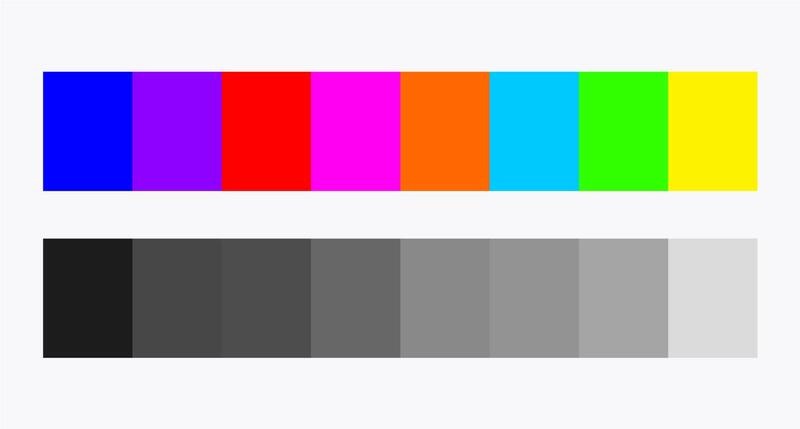 Even though the colors on the top row are at 100% brightness and saturation, their corresponding grayscale values vary dramatically. Boom! A whole range of gray values is revealed. Why does this matter for UI designers? One word: Contrast. Switch your mind to grayscale for a moment. If you were looking to create contrast, would you ever use a 40% gray value on top of a 50%? Of course not, but this is exactly what’s risked when hue is left out of the color contrast equation. Remember, hue always impacts value. Now that we’ve simplified color theory and related its core concepts to UI design, it’s time to take a more focused look at the role color plays in digital interfaces. These are the four color principles that must be considered from the earliest efforts of every UI design project. The relationship between text and color is crucial. Color accessibility can’t be ignored. Contrast is essential, but it’s not a design cure-all. Color works best when applied proportionately. Color affects readability. Most UI designers understand this in principle, which is why we don’t see many interfaces with green body text on red backgrounds. 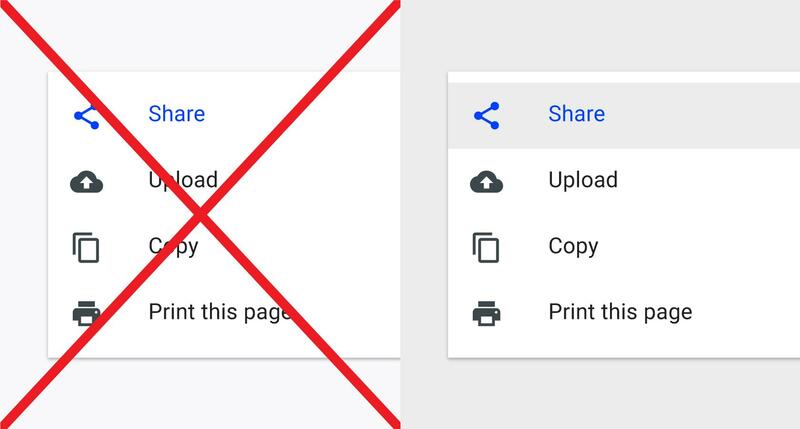 Instead, the tension between text and color comes on subtly, creeping in through common UI components like forms, buttons, headers, and icons. Always avoid low contrast between text and background. Don’t use complementary colors for text and background, especially when the colors are of similar brightness and saturation (e.g., yellow text on a purple background). Even on white backgrounds, don’t set body text in bright colors. Black and dark gray are the easiest to read. 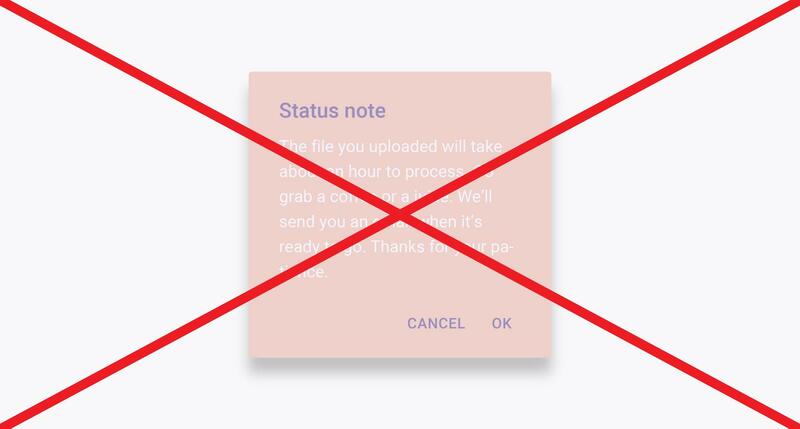 The color scheme of this status note may be visually appealing, but the user experience is jeopardized by insufficient contrast between background and text. Color is communicative, but it can’t be the only design element used to convey information in a UI. Why not? Because some web users perceive color differently (or not at all) than the majority of the population. For example, a person that experiences color blindness may not be able to tell when a product icon is in its “pressed” state if the only difference in the icon is a color change. When conveying information to users, UI designers must strive for web accessibility by pairing color changes with additional visual cues like shapes and fills. Additionally, some people have difficulty seeing important UI components that are low in color contrast to an interface’s background. Sites like Colorable and Contrast Ratio allow designers to quickly test a range of color pairings for contrast accessibility. Yes, color contrast in UI design is important. Plan for it, implement it, benefit from it. But don’t expect to wave it like a magic wand and fix poor design. Shape, space, size, and other design elements must not be ignored. Color contrast can make an awful UI look appealing, but it won’t fix a bad user experience. Imagine a news app where every instance of text is set in title case or an eCommerce website designed on a 9×9 image grid. Both would be terrible! 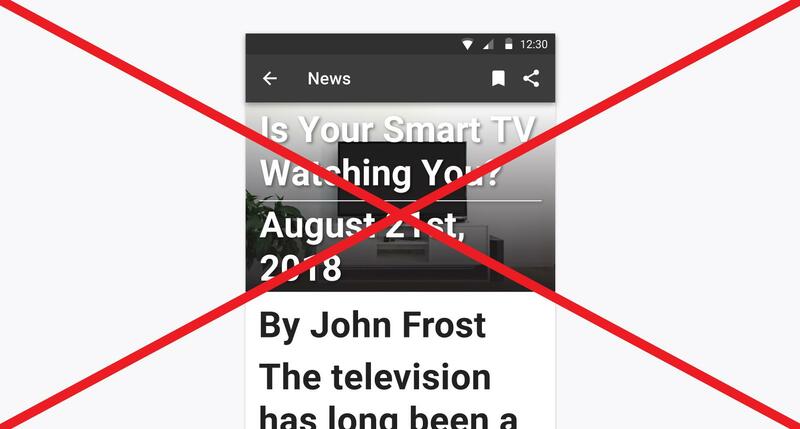 Because the title, date, author, and body text are all the same font size, the reading experience is hindered and no single piece of information stands out. A similar problem occurs when UI designers overload interfaces with color. Savvy UI designers employ design elements like typography and repetition proportionately to enhance design hierarchy. Color deserves the same thoughtful consideration. In UI design, using too many colors confuses the way information is perceived. Here’s an inconvenient truth: Designing with color is a skill, and skills must be developed. Most UI designers have an innate sense of what colors look good together (a.k.a. color taste), but this doesn’t always translate to application. To truly master color and see its full impact on UI design, designers must practice. Luckily, there are plenty of resources to help with continued color learning and skill building. If you’re a UI designer looking to gain immediate color confidence, start with ctrlpaint.com, a website dedicated to digital painting instruction. Digital painting? Really? Absolutely. Professional concept artist Matt Kohr teaches digital color use through quick video tutorials and hands-on exercises. The curriculum is wonderfully simple and centered on “painting what you see,” both in the physical world and imagination. Start with the free video library (Section 11) before moving to the more intensive exercises in the Color Starter Kit. Matt Kohr’s digital concept paintings exhibit a mastery of color theory, and his instructional videos are fun and easy to follow. 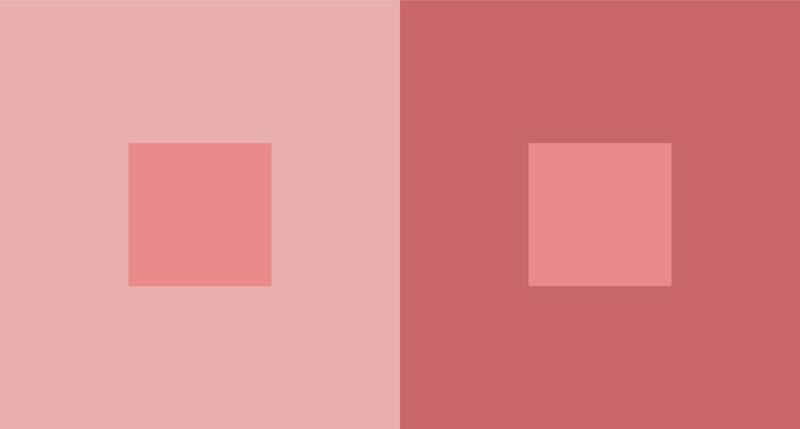 The contemporary understanding of color relativity was heavily explored and advanced by the practice-before-theory approach of artist/educator Josef Albers. Albers proposed that a single color could have “many faces” and encouraged extensive play and experimentation among his students in hopes that “eyes would be opened” to see color as it truly behaves in the real world (as opposed to the symbolic colors we envision in our minds). In 1963 Albers authored Interaction of Color, a textbook that continues to be highly influential in the world art and design education. To celebrate the 50 year anniversary of the book’s publication, Yale University released an interactive iPad app that contains the full text but also allows users to play and experiment with Albers’ color plates. One of the best ways to get better at working with color is experimentation. The Interaction of Color app is an easy and intuitive way for UI designers to create custom palettes and see how colors relate to one another. 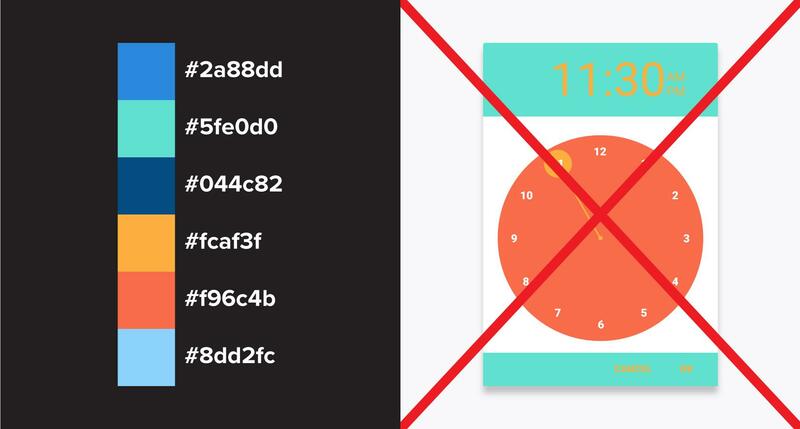 For UI designers, the Interaction of Color app provides an opportunity to experience analog color exercises in a digital environment and see firsthand how color relativity impacts user interfaces. During the first half of the 20th century, Andrew Loomis was a prominent illustrator and instructor at the American Academy of Art in Chicago, but his enduring legacy is that of author. 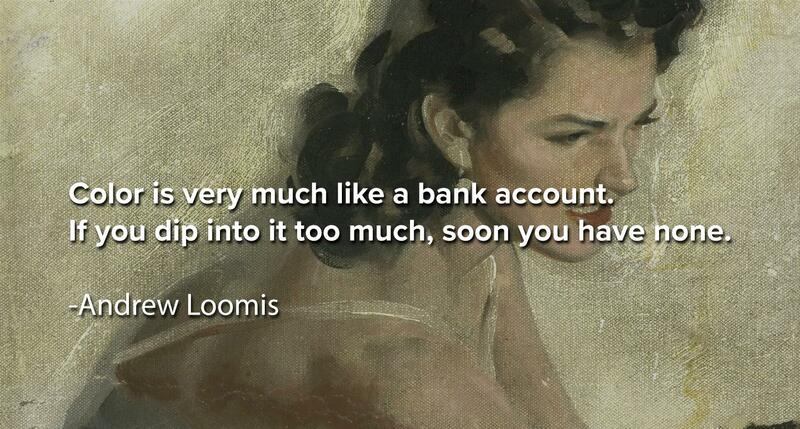 Loomis wrote six books on commercial art and design and covered a range of topics from figure drawing to product placement. Although originally written for painters and illustrators, Andrew Loomis’ book Creative Illustration offers practical color insights that UI designers can rely on when designing interfaces. Once a basic level of color competency is achieved, color scheme creation blossoms into a fascinating pursuit. Every interface encountered becomes an opportunity for learning and critique, and observations abound. This is the stage of a UI designer’s development when referencing the work of other designers becomes empowering. How so? Because referencing moves from destination to journey, from endpoint to inspiration. Searching for interface color inspiration? Try the Webby Awards website. It’s full of incredible examples organized into industry-specific categories. UI designers of all skill levels stand to benefit from keeping an ongoing record of found UI color schemes. Take screenshots, keep a physical color journal, start a mood board—whatever it takes to imprint moments of color illumination for future implementation. When it comes to the design of digital interfaces, color isn’t an optional consideration. Even in UIs that employ minimal color (or those that are entirely black and white), it’s imperative that UI designers understand why color is or isn’t being used and how this affects the user experience. It’s also important that UI designers have the ability to generate and implement original color schemes. Referencing the work of other designers and digital products is a worthwhile practice, but this becomes limiting when it’s the only method of color exploration undertaken during the design process. There’s immense value in being able to capture color pairings seen in the real world or mind’s eye. If you’re a designer that’s struggled to use color skillfully or you’ve ever thought, “I don’t really have a knack for color,” don’t be discouraged. Designing with color isn’t some form of creative wizardry or special gifting; it’s a practical discipline founded on simple techniques that can be repeated and improved upon. Remember, color is the master key to clear and compelling design communication. Whether implemented with care or reckless abandon, it impacts conversion, brand awareness, and the user experience. For the UI designer, color is a powerful tool that simply can’t be ignored. What is a palette of colors? In digital design, a palette of colors is the range of colors that are available to a designer. However, these colors are not necessarily in harmony with one another. What is a color scheme? A color scheme is a selection of intentionally paired colors that are in harmony with one another. Color schemes are typically assembled according to logical relationships suggested by a color wheel. What is the function of a user interface? A user interface allows a human to interact with a computer. This interaction, which is often visual, can take place through a range of devices such as a mobile touchscreen, a keyboard, or a control panel. Next articleautomated testing – How to open browser using selenium and python with robot framework?